Almost 300,000 women die from complications of pregnancy and childbirth every year and for every maternal death at least another 20 women suffer from injury or illness, often with lifelong consequences. Today, 99% of maternal deaths occur in developing countries, with more than half in Sub-Saharan Africa. 220 million women and girls in developing countries want to delay or avoid pregnancy, but are not using modern contraception. Reasons for non-use include lack of information; opposition from partners or others; and difficulty obtaining services and supplies. 41% of global pregnancies are unintended and 43.8 million abortions occur each year – nearly half of these are unsafe and 98% of unsafe abortions occur in developing countries. The vast majority of these maternal deaths are preventable – yet pregnant women around the world continue to die because they do not have access to timely emergency obstetric care. Adding to this problem is the high unintentional pregnancy rate of many developing countries – 41% of global pregnancies are unintended and 220 million women want to prevent pregnancy and are not using contraception. Bloomberg Philanthropies works to address these needs by providing access to quality maternal and reproductive health services, and advocating for the provision of these services by the national government in the countries where we work. Tanzania has the sixth highest number of maternal deaths in the world and fourth highest in Sub-Saharan Africa. In Tanzania, a woman dies from complications of pregnancy and childbirth almost every hour. For every woman that dies, another 20 suffer an injury, illness or disability, often with life-long consequences. Maternal survival is closely linked to child survival. The same conditions that cause death and illness in pregnant women also result in death and illness in millions of newborn babies. Furthermore, threats to a mother’s life also jeopardize the survival of her other children, especially if they are girls. We know that access to comprehensive emergency obstetric services can prevent most of these deaths, yet women continue to die because health care facilities with skilled personnel are few and far between. Approximately 15% of pregnancies and childbirths will result in a life-risking complication. It is impossible to predict when a complication will occur – that is why all pregnant women need access to life-saving care. Bloomberg Philanthropies is committed to working with other donors to address the most critical public health issues of the day. Fondation H&B Agerup and the Blue Lantern Foundation co-invest in our Maternal and Reproductive Health Project in Tanzania, and we joined the Bill and Melinda Gates Foundation’s call to action when making our $50 million commitment to Family Planning 2020 (FP2020). Investing with other donors makes our program more impactful and cost effective. Strong partnerships enable us to work more effectively. In Tanzania, Bloomberg Philanthropies is working with Vital Strategies, the CDC Foundation, and EngenderHealth to provide quality emergency obstetric care and reproductive health services in the most remote areas of the country. After pledging our commitment to Family Planning 2020, we partnered with them in launching the Rapid Response Mechanism to fill unanticipated, urgent gaps that countries face in fulfilling their reproductive health goals. Also under our Family Planning 2020 commitment, we’re working with Planned Parenthood Global to support local nonprofits to advocate for the expansion of reproductive health care in Nicaragua, Burkina Faso, Senegal, and Uganda. All of our public health programs are rigorously evaluated to ensure that our work is making a difference. The CDC Foundation performed an impact evaluation of our maternal health activities in Tanzania, as well as a reproductive health survey in Kigoma Region – these studies inform our decision-making to ensure our project is making positive impact. The crux of the Bloomberg Maternal and Reproductive Health Program is to bring quality health care and services to the communities and villages where it is needed the most. Bloomberg Philanthropies is also committed to empowering local organizations to advocate for the services and care they need in their communities. running mass media campaigns and employ community health workers to educate communities about the importance of skilled birth attendance and family planning. Remote areas of Tanzania face extreme human resource shortages and medical doctors, let alone obstetricians are few and far between. To compensate for these shortages, the Tanzanian government supports “task-shifting” of medical services, which allows non-physician clinicians to deliver certain types of care, including emergency obstetric care, that have been traditionally provided medical doctors. By building operating rooms and training more healthcare workers, our program has expanded the coverage of maternal health and brought life-saving emergency obstetric care to the women who need it most. Over the years of working in Tanzania, the healthcare workers we support saw many women die from complication dues to an unsafe abortion, and many mothers at the clinics said they want access to reproductive health services. In response, we enthusiastically joined the Family Planning 2020 partnership in 2012, pledging $50 million to global family planning efforts. With this new commitment, we enhanced our Tanzanian program in 2013 to include access to contraception, post-abortion care, and family planning counseling at the health clinics we support. 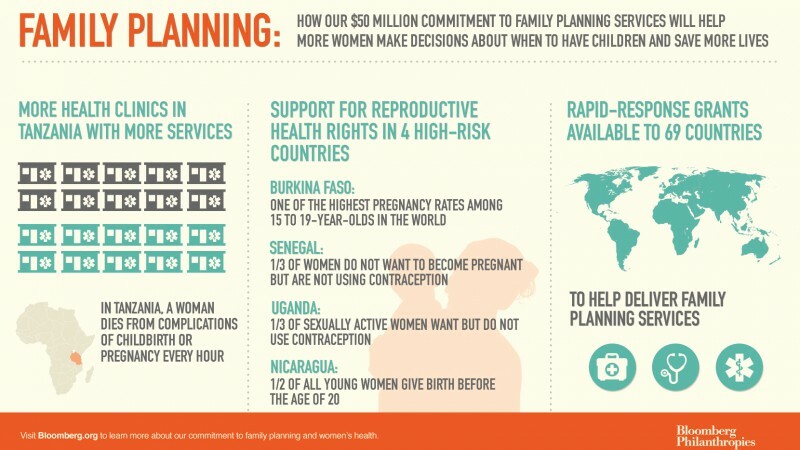 Co-convened by the Bill and Melinda Gates Foundation, Department for International Development, and the UN Population Fund, Family Planning 2020 is a global partnership that supports the rights of women and girls to decide, freely, and for themselves, whether, when, and how many children they want to have. Family Planning 2020’s goal is to enable 120 million more women and girls to use contraceptives by 2020. As a member of this partnership, we have committed funds to a Rapid Response Mechanism. These grants will support one-time, urgent, unanticipated gaps that any of the 69 Family Planning 2020 countries may encounter as they work towards achieving their Family Planning 2020 goals. To additionally support the Family Planning 2020 partnership, we decided to make strategic investments in 4 of the partnership’s countries. Starting in 2014, we began supporting local nonprofit organizations in Burkina Faso, Senegal, Uganda, and Nicaragua to advocate for better policies in their countries that will expand access to comprehensive reproductive health services. These organizations will receive technical assistance from Planned Parenthood Global, the international division of Planned Parenthood Federation of America, to help augment their capacity for effective advocacy. In all of these countries, the local advocates are determining the agenda based on their deep understanding of the challenges women face to access reproductive health services. All of these programs aim to address local demand for reproductive health services – we listen to women and health advocates in the countries and support them in achieving their goals. Vital Strategies, one of Bloomberg Philanthropies’ lead partners in Tanzania, launched a mass media campaign called Thamini Uhai (“Value Life”) to educate women and their spouses about the dangers of home delivery. The radio spots were broadcast in remote areas, and community health workers were trained to educate villages about the importance of delivering in a health facility. Joy, a woman living in a distant village, heard this radio campaign and when she went into labor she came to Mabamba Health Center. The staff soon realized she would not be able to deliver normally and prepared her for a c-section, which they completed successfully. Joy’s baby girl was delivered at 2.8kg but was very tired and could not breathe well. The staff resuscitated the baby and gave her oxygen until she was stable. Thanks to the life-saving operation, both mother and baby were discharged in good health within 12 days of the delivery. This is just one example of how our interventions, both educating communities and providing quality obstetric care, work together to reduce maternal mortality. Preliminary results suggest that the situation is improving in Tanzania. 16 remote health centers have been upgraded and equipped to provide comprehensive emergency obstetric care, including cesarean section. More than 160 non-physician clinicians have been trained in comprehensive emergency obstetric care or anesthesia. To date, over 90,000 deliveries were attended and over 5,250 cesarean sections were performed in the upgraded health centers. Between April 2013 – April 2016, nearly 125,000 clients accessed family planning services in our target regions. Additionally, 861 post-abortion clients were counseled on family planning services. Between April 2013 – April 2017, it is estimated that 181,418 unintended pregnancies were averted, 53,855 abortions were prevented, and 385 maternal deaths were averted due to the family planning services provided by our partner, EngenderHealth. The next phase of the program will focus on creating demand within communities for maternal and reproductive health services. We will run more media campaigns to educate communities, recruit and deploy community health workers to reach remote villages, and ensure that every woman and girl who wants contraception can access the method of her choice. FP2020, the global partnership to re-invigorate funding for family planning, launched the Rapid Response Mechanism in July 2014. This funding mechanism was established by Bloomberg Philanthropies to respond to urgent, catalytic gaps that arise in low-income countries as they work to achieve their family planning goals. Since the launch, over 50 organizations have applied for funding and 10 have been awarded a grant. In Burkina Faso, the unmet need for family planning is about 30% – that means a third of women want to space or limit their births, but are not currently using modern contraceptives. As part of their FP2020 commitment, the national government recently reduced the price for long-acting reversible contraception, like implants, in order to make it easier to access those kinds of contraceptives. Capitalizing on this moment to overcome barriers for youth access, a local nonprofit applied for a Rapid Response Grant. BURCASO was awarded a one-year grant to increase family planning use among youth in two health districts – they plan to reach 12,500 adolescents and create sustained demand for these kinds of contraceptives. Get the facts on the United Nation’s Millennium Development Goals and the quality of maternal health in Africa.